I’ve written before about how salt is not the villain it is often made out to be. There is some age-old evidence that not only is salt not harmful, but that consuming it daily (in a certain form) can be very beneficial for health. Sole (pronounced Solay) is essentially water that has been fully saturated with a natural salt. This isn’t just a small amount of salt dissolved in water, but rather water that has absorbed as much natural salt as it is able and will not absorb any more (26% actually…. thanks high school chemistry). The term Sole comes from the Latin “Sol” meaning Sun. Helps Hydration– The body naturally repairs and detoxifies during sleep, but in doing so, it uses up a good amount of water. This is why we are often more thirsty in the morning. 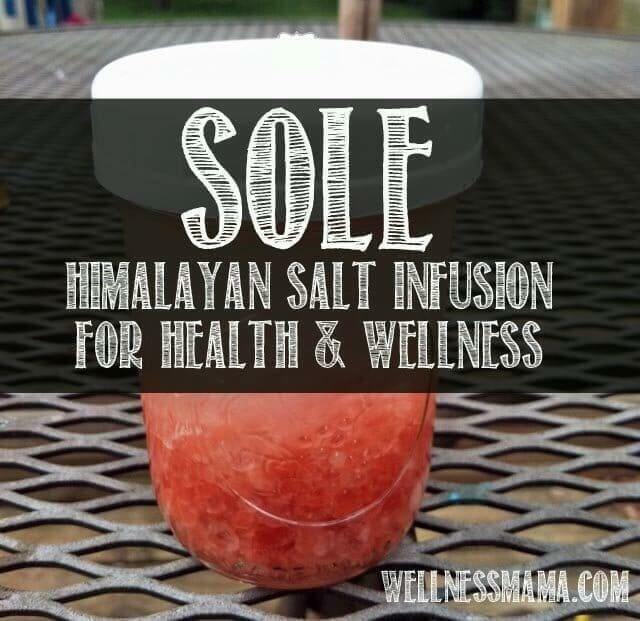 Consuming a salt solution like Sole helps the body re-hydrate. Helps the Body Detoxify– The minerals in Sole make it useful in the natural detoxification that the body already does. Sole is naturally anti-bacterial and can help remove bad bacteria in the body. Boosts Energy– The minerals and stored energy in Sole help boost energy throughout the day. Improving Digestion– Sole stimulates the digestive system promoting food absorption and regularity naturally. Improving blood sugar– Some people note improvements in blood sugar levels after using Sole. A Natural Anti-histamine– Sole can work as a powerful natural anti-histamine. This action is likely due to its balancing effects on the body, and I have noticed this personally. Helps with Muscle Cramps– When I played sports, we attributed leg cramps or other cramps to lack of potassium and ate more bananas (which are now the only food I won’t eat). Don’t know about the potassium theory, but I know that since using magnesium and Sole regularly, I don’t get leg cramps anymore (even during/after extreme exercise or in late pregnancy). Bone Health– There is a theory that a potential cause of Osteoporosis and other bone disorders is the body utilizing calcium and other minerals from the bones for survival and to neutralize acidity in the blood. Sole is naturally full of minerals and alkalizing, so there is speculation that it is helpful with bone health as well. Healthy Veins– By supporting the correct mineral balance in the body and blood, Sole can help reduce or avoid vein problems like varicose veins. Blood Pressure– Contrary to what we often hear, many people notice a reduction in blood pressure from using Sole. Weight Loss– By improving digestion and nourishing the body on a cellular level, Sole can help promote weight loss. Healthy Skin, Hair and Nails– Sole’s high mineral content makes it great for healthy skin (and acne problems), and for hair and nail growth. It is interesting to note that the conventional treatment for many of the above problems includes removing excess salt/sodium from the diet. 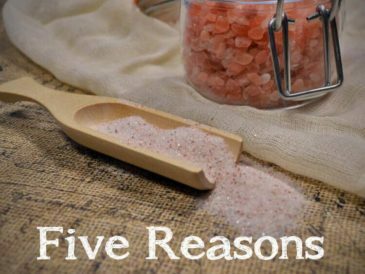 While table salt could certainly have a negative effect and is best avoided, natural salt contains over 84 minerals and is incredibly nourishing for the body. Even better, Sole is a very inexpensive addition to a healthy diet and lifestyle and it is incredibly easy to make. As Sole is simply salt and water, the quality of the salt is extremely important. 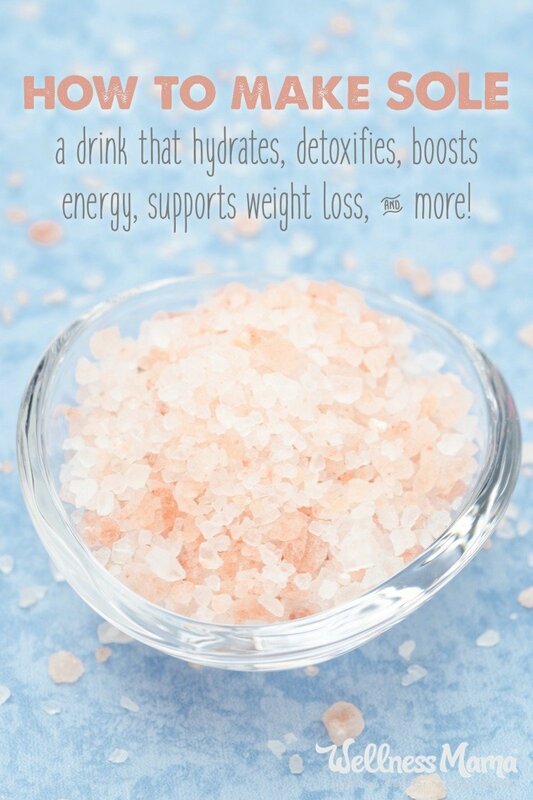 I prefer to use mostly Himalayan salt, with a small amount of Redmond Salt or Celtic Salt added. The following are brands I have used personally and can vouch for, though many local health food stores will carry Himalayan Salt (make sure it is pure… it should be pink). As I said, the only ingredients are salt and water so the recipe is pretty simple. You’ll also need a glass jar with a plastic or non-metal lid. I used a regular mason jar. 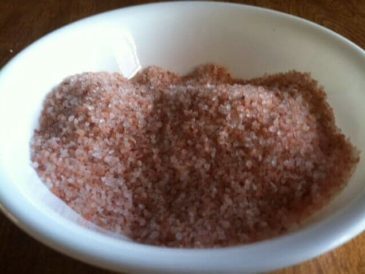 Fill the jar about 1/4 of the way with Himalayan Salt, Real Salt or Celtic Salt (or a mixture of the three). Add filtered water to fill the jar, leaving about an inch at the top. Put on the plastic lid and shake the jar gently. Leave on the counter overnight to let the salt dissolve. Sole is ready to use. If all of the salt is absorbed, add more salt and continue doing so each day until some remains. This means that the water is fully saturated with the salt. To use: Mix 1 tsp of the Sole in to a glass of water and consume every morning on an empty stomach. Do not use a metal utensil to measure or touch the Sole with any metal object. I am not a doctor and don’t play one on the internet. As with any health advice, consult a qualified practitioner before adding any new supplements, especially if pregnant, nursing or if you have a medical condition. Make the mixture as above and store at room temp. It will last indefinitely as salt is naturally anti-bacterial and anti-fungal. More water and salt can be added as needed to keep up the amount in the jar. To drink, add 1 tsp to a glass of water each morning before eating or drinking anything else. Do not add more, especially starting off! If this causes a detox reaction or headache, work up slowly. Have you ever made Sole? How did you like it? Share below! Are You Scared of Salt?